I dag har jeg laget et nytt kort med denne herlige jenta Saturated Canary - Janessa. fargene sammen. Mønstepapirene er fra Maja Design. Image: Saturated Canary - Janessa. Nydelig kort, som er utrolig flott fargelagt. Såååå lekkert kort i herlige farger. Aldeles nydelig! like dyktig som alltid. A super card. Love all the colours used. Thanks for sharing with us at Penny's and good luck. Such a super card. The colouring is just fabulous. Very beautiful card! Great coloring job! Thanks for playing along with us at Penny's Paper-Crafty. Gorgeous card, your colouring is beautiful. Thank you for joining us at A Gem of a Challenge. 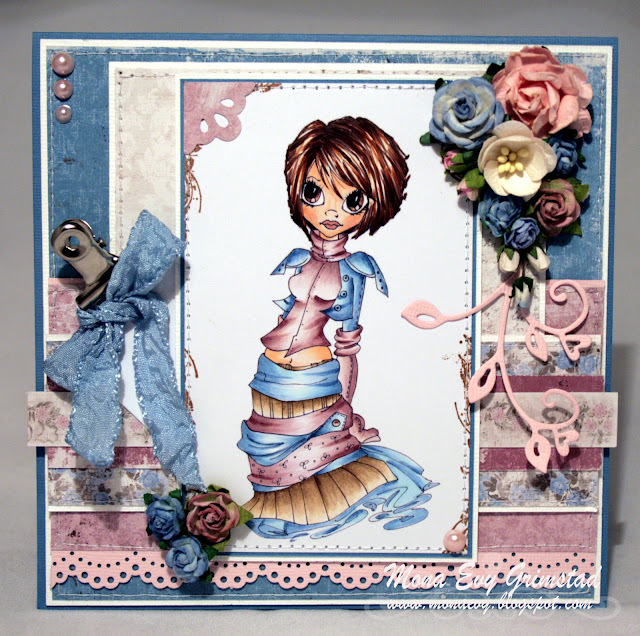 Totally loving this card I love this image & your colouring on her is brilliant. Wow!! Knallstilig kort Mona! Og fargene passer så godt sammen. Wow, what a great card. Your coloring is fantastic and the layout looks perfect. I love it! Thanks for joining us at By the Cute and Girly. Wow Mona! I really envy your colouring skills! Amazing work! Good luck in the Crafter's Companion challenge!